You, CAN DO IT ! ! ! Thought I would send a little laughter your way with a positive message. Most people get discouraged when facing a challenge in life before they even really give things a chance to be successful; they are defeated before they even begin. There are things in life that can overwhelm us if you let them. But if you take on things with a positive “can do” attitude, there are no boundaries to the things that you can accomplish. 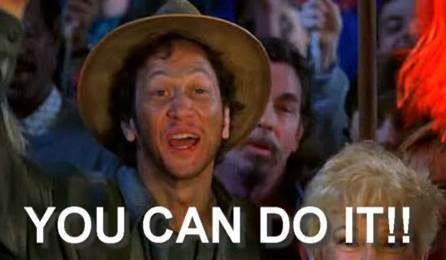 So when you are facing those challenges and think you are having trouble, just remember this guy from the movie “The Waterboy” and tell yourself “YOU CAN DO IT”. To get the latest book from this author. Click on the Daily Fuel for LIFE and LEADERSHIP link above to download from Amazon. Connect with the author by visiting Leadertank.com for more motivational and inspirational messages.